How Humans Could Halt Climate Change By 2050 : Goats and Soda Let's imagine that we've ended global warming. Humans no longer are releasing greenhouse gases into the atmosphere. Here's what life is like in a zero-carbon world. When NPR interviewed Rep. Alexandria Ocasio-Cortez in February about her Green New Deal, she said that her goal was bigger than just passing some new laws. "What I hope we're able to do is rediscover the power of public imagination," she said. Well, we're unleashing our imagination and exploring a dream, a possible future in which we're bringing global warming to a halt. It's a world in which greenhouse emissions have ended. So — what does this world look like? 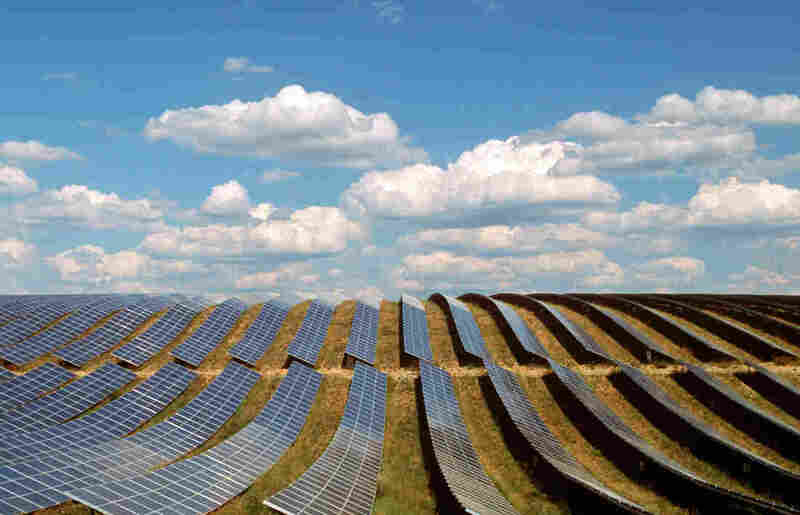 Solar panels fill a field in Provence-Alpes-Cote d'Azur, France. 2019: I went looking for people who've mapped out this world without greenhouse emissions. I found them in Silicon Valley. Sila Kiliccote is an engineer. The back deck of her house, high up in the hills, overlooks Cupertino. Apple's circular headquarters is hidden in the morning mist. It's a long way from Istanbul, in Turkey, where she grew up; a great place to conjure up future worlds. "Maybe you'd like some coffee?" Kiliccote says. 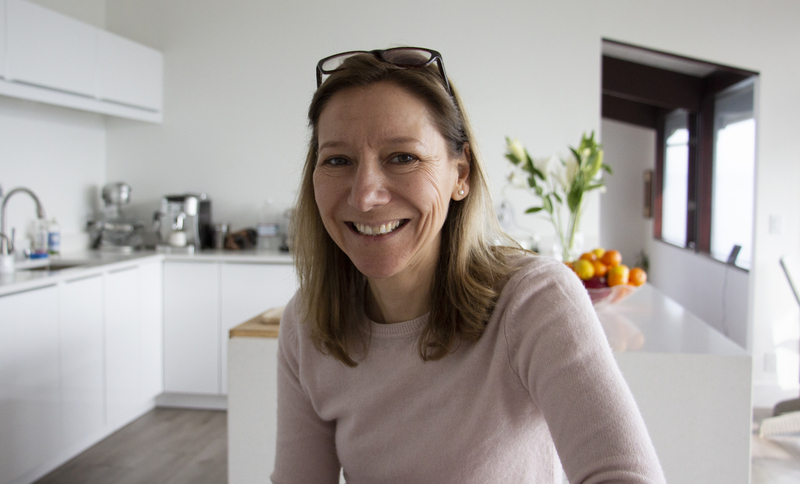 Her coffee machine is powered by solar panels on the roof. So is her laptop and her Wi-Fi. "Everything runs on electricity in this house," she says. This is the foundation of a zero-carbon world: Electricity that comes from clean sources, mainly the sun and the wind, cheap and increasingly abundant. Today, it powers this house; tomorrow, it could drive the world. Last year, Kiliccote quit her job at Stanford University and launched a startup company, eIQ Mobility, helping companies replace their fleets of vehicles, such as delivery vans, with electric-powered versions. "In order to have impact, timely impact, I figured that I need to leave research and focus on impactful things that I want to do. And fast," she says. It has to happen really fast. Last year, the world's climate scientists put out a report showing what it will take to limit global warming to 1.5 degrees C by the end of this century, averting the worst consequences of climate change. It requires bringing the globe's net greenhouse emissions down to zero by 2050. It's a giant leap for humankind. So Sila Kiliccote and I take that leap. Sitting in her kitchen, with solar panels overhead and an electric car parked outside, we pretend that it has happened. It's 2050 and we've stopped climate change. "Any sense of how we did it?" I ask her. She pauses. "Yes," she says. "By 2025, battery technology got cheaper," she says. Electric cars were no longer more expensive. "At that point there was a massive shift to electric vehicles, because they were quieter, and cleaner, and [required] less maintenance. No oil change! Yippee! You know?" Heating and cooling in homes and office buildings have gone electric, too. Gas-burning furnaces have been replaced with electric-power like heat pumps. We needed more electricity to power all this right when we were shutting down power plants that burned coal and gas. 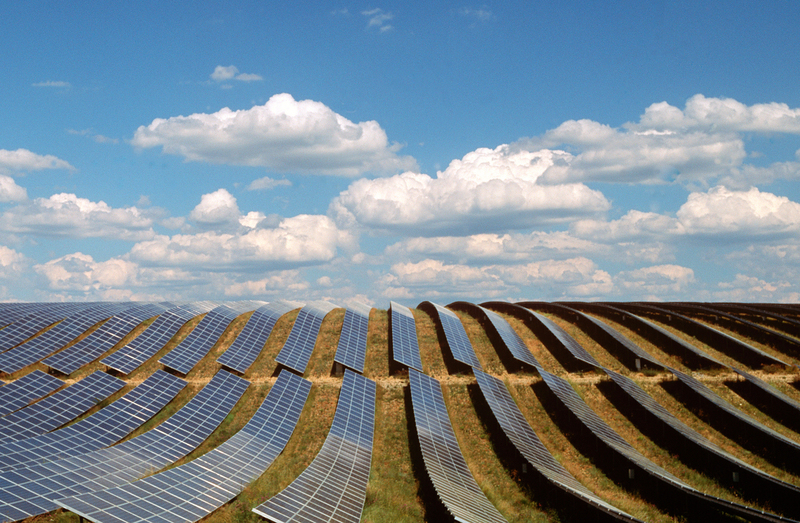 It took a massive increase in power from solar and wind farms. They now cover millions of acres in the U.S., 10 times more land than they did in 2020. Huge electrical transmission lines share electricity between North and South America. Europe is connected to vast solar installations in the Sahara desert, which means that sub-Saharan Africa also has access to cheap power. "It just changed Africa," Kiliccote says. "It actually fueled the economies of Africa." We now store electricity so that it's always there when we need it. With batteries, of course, but in lots of other ways, too. For instance, cities are using electricity to heat and chill massive tanks of water, which then heat or cool buildings at any hour of the day or night. Sila Kiliccote left Stanford University and founded eIQ Mobility, a startup company focused on helping companies electrify their fleets of vehicles. Sally Benson, co-director of the Stanford Precourt Institute for Energy, is so ready to take the leap and imagine this zero-carbon world 2050, it's a little startling. "I regularly take a helicopter, an electric helicopter, from here to San Francisco," she assures me, totally deadpan. "You can run a helicopter on batteries?" I ask, not quite believing it. "Oh, yes! Oh, God, yes. That happened a long time ago," Benson says, laughing. "That happened in the 2030s. That was great." But she says that even in this all-electric world, there are some holdouts. Some things have just been really hard to electrify. Some big cement and steel plants still are burning coal or natural gas, but they also have to install massive plants to capture carbon dioxide from their smokestacks and put it back underground. "We just had to kind of bite the bullet and say, 'OK, if you're making cement or steel, you are capturing and sequestering that CO2,'" Benson says. "And in some cases we actually had to say, 'We're not going to make those things here anymore'" because it wasn't economically feasible to capture the CO2 emissions from that factory. Big, long-distance freight trucks were a problem, too. "They're really heavy, and batteries are really heavy, and if you have to put a whole bunch of batteries on a truck it's really inefficient," Benson says. In some areas, like this one, our picture of the future gets a little fuzzy. Different guides to this 2050 world show me slightly different things. Some of my guides see "electric highways" with wires overhead, and trucks tapping into the electric power in those wires the same way trains do. Others see trucks running on hydrogen fuel; we make that hydrogen using solar or hydro power. It appears that aircraft still are burning jet fuel. When you buy a plane ticket, you're also paying to cancel out that flight's carbon emissions, capturing an equivalent amount of CO2 from the air. This makes air travel expensive. Fortunately, we now have much faster trains. Teleconferencing helps, too. Sally Benson is absolutely convinced about one thing. The hardest part of this journey wasn't finding technical solutions. They all existed, even back in 2019. The hardest part was navigating the social disruption. "The transformations were so profound that it really needed to be a collective effort," she says. Entire industries died — like oil exploration and gas furnace manufacturing. Others rose to take their place, as the country rebuilt its electrical systems. People didn't know what would happen and they were scared. The changes only moved ahead when people were convinced that they weren't getting ignored and left behind. It was the political struggle of a generation. Now, in 2050, there's a tremendous sense of accomplishment. "Are there children who look around at all the old buildings and say, 'What are those things they call chimneys? What were they for?' " I ask. "They do," Benson says with a chuckle. "You know, it's like a historical artifact, but you know, they find it very touching. They are appreciative, because they're living in a world where they don't need to worry about climate change anymore." It wasn't easy and it wasn't free, Benson says. But it was absolutely worth it. The air is so much cleaner. Cities are quieter. And we're no longer heating up the planet. 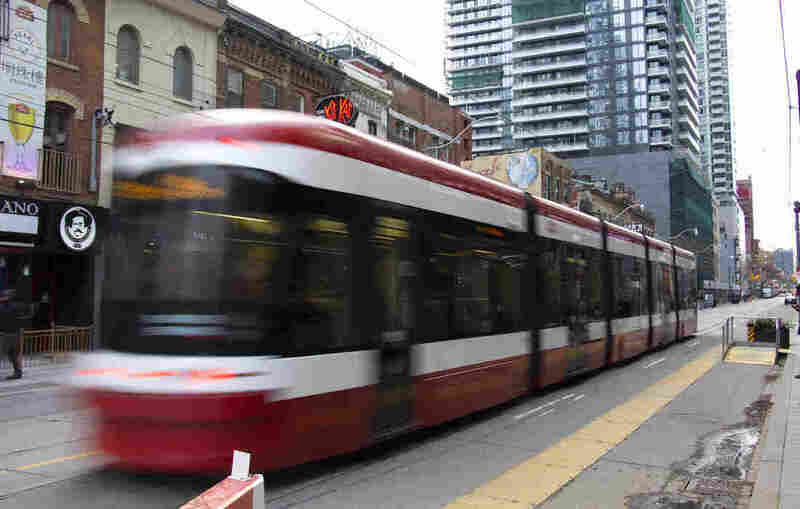 A streetcar rolls down King Street in downtown Toronto. Most car traffic has been diverted from this section of the street. 2019: I'm taking a walk through downtown Toronto, in Canada, with Jennifer Keesmaat, the city's former chief planner. Keesmaat wants me to see one particular street. King Street. It's the seed of a zero-carbon future, she says. King Street has a little bit of everything: glass-walled office buildings, theaters, old brick warehouses. Two years ago, a new set of traffic rules went into effect here. 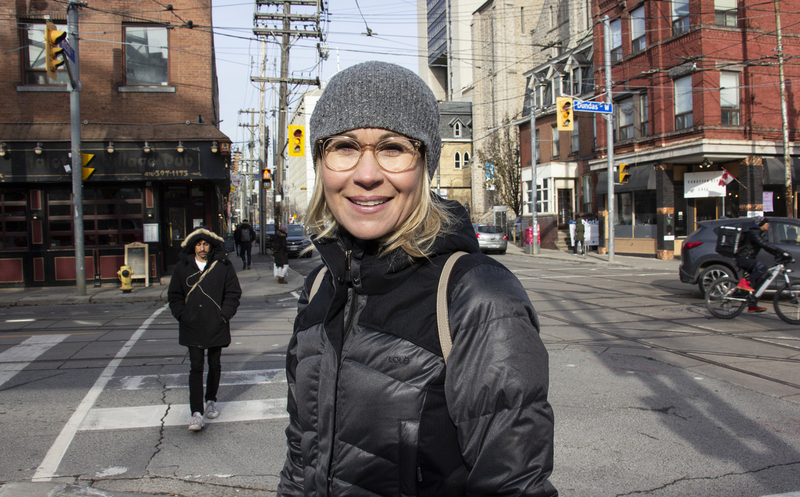 "Basically, what we've done is, we've limited through-traffic for cars," Keesmaat says. It forced cars away from King Street and launched a whole cascade of changes. 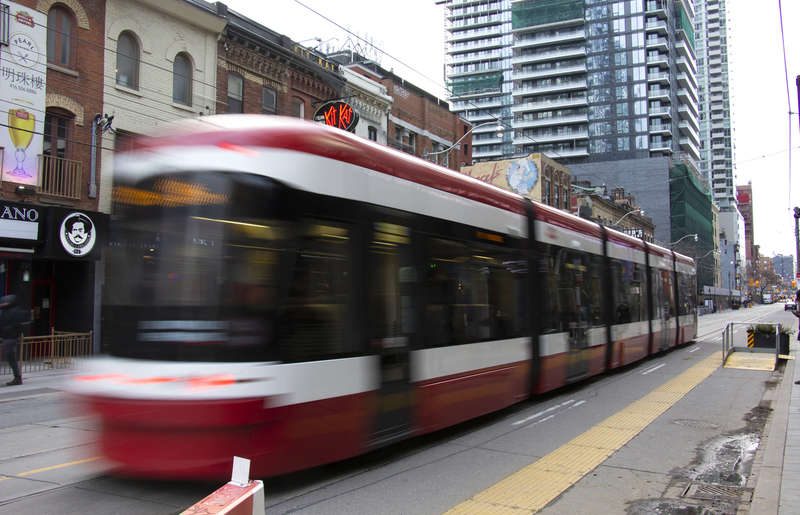 The streetcars that run down the middle of King Street weren't stuck in traffic anymore. They became the best way to get across town at rush hour. "The volume of people being moved is astronomical!" Keesmaat says, as one rolls by. The streetcars, of course, are powered by electricity, and one passes every two or three minutes. Meanwhile, thousands of people have been moving into this downtown neighborhood, buying condos and renting apartments. Keesmaat knows one of them. He's the father of one of her friends. "He said to me a few weeks ago, he thinks he takes out his car about once every two weeks," Keesmaat says. He walks to shops, restaurants and basketball games. His neighbors walk to jobs in the financial district right down the street. He's not heating a big free-standing house, either. He has cut his energy use, and his greenhouse emissions, dramatically. "That wasn't the driver for him," Keesmaat says. "He didn't say, 'How do I in fact live smaller?" It just happened naturally in this new urban geography. For a city planner, like Keesmaat, this is totally inspiring. "When we provide people with real choices, better choices, it can open up our minds!" she says. "We can change our minds about what we thought was the only way to live." Jennifer Keesmaat is the former chief city planner of Toronto. She also hosts a podcast called Invisible City. 2050: At this point, Keesmaat and I open up our minds and take a leap into a world that could be. Greenhouse gas emissions have dropped to zero. How did we do it? By gradually reshaping our cities so that they look more like this neighborhood, with lots of people living close together, within walking distance of many of the things they need. Keesmaat can already see this city in her mind, and describe it. "The vast majority of streets have been pedestrianized; that's how people get around, by walking down the street," she says. "What has happened to the sprawling suburbs?" I ask. "Are people living there? How are they getting around?" "Some of the large homes haven't changed at all," Keesmaat says. They've just been turned into multifamily units." Other free-standing houses that once lined suburban cul-de-sacs have disappeared; each one has been replaced with a building that contains five or six homes. With the local population booming, those neighborhoods also attracted shops and offices. Suburban sprawl morphed into urban density. Cars have mostly disappeared. "There are cars, but people don't own cars," Keesmaat says. "Because a car is something that you use occasionally when you need it." Streetcars and buses go practically everywhere in the city now, and you rarely have to wait more than a couple of minutes to catch one. Fast buses and trains connect towns. For other destinations, there's car-sharing. "2050? It's a wonderful life!" says Daniel Hoornweg, another one of my guides to this zero-carbon world. He's a professor of energy systems at the University of Ontario Institute of Technology. Years ago, he wrote a big report on cities and climate change for the World Bank. He also can describe this new city, and how it took shape. Local governments created it, he says. First, they gave people new ways to get around: subways, bike lanes, buses and streetcars. But along with those carrots, there was also a stick. Cities took control of the precious real estate known as "roads" and started charging for the right to use them. "Maybe the most powerful thing that got us here, is [that] we got the pricing right," he says. "So, you want an autonomous vehicle? Bless your heart, but it costs you more to drive that autonomous vehicle on the road by yourself. If you ride-share, it's a little bit less." "And this is even if they are electric vehicles?" I ask. "Even more if they're electric vehicles!" Hoornweg says. Personal electric cars for everyone couldn't solve the problem, he explains. First of all, electricity is precious. We can't waste it powering everybody's electric car. Second, electric cars could have clogged the streets of our densely populated cities the same way gas-burning cars once did, back in, say, 2019. Our city of 2050 functions because streets are clear for buses and streetcars and bikes. The basic recipe — densely populated neighborhoods linked by mass transit —has been the same for cities all over the world, Hoornweg says. But the details came from constant experimentation. If an idea worked in one place, other cities snatched it up. For instance, way back in 1991 the city Curitiba, in Brazil, built dedicated roads for fast buses, kind of a train system running on wheels. That kind of system has now spread around the globe. And it wasn't just technology, Hoornweg says. Over the past three decades, from 2020 to 2050, a huge cultural shift has taken place. Just one example: In Toronto, the sharing economy that started decades ago with Uber and Airbnb is everywhere now. "Sharing rides, sharing tools, sharing somebody to look after your dog when you're not there." Yes, we apparently still have dogs in 2050. But the scale of zero-carbon life also makes it easier to share. We're living closer together and run into neighbors all the time. "We have more acquaintances — somebody we met in our ride pool or car pool or whatever," Hoornweg says. "There's no better way to [meet your neighbors] than sitting in a [shared] car and you can't get away from them for 20 minutes or whatever." Some people hated losing their yards and their solitary commutes at first. Others loved the changes. Eventually, Hoornweg says, it just became normal. People stopped talking about it. Life now goes on as it always did. But there's one huge difference. We're no longer heating up the planet. 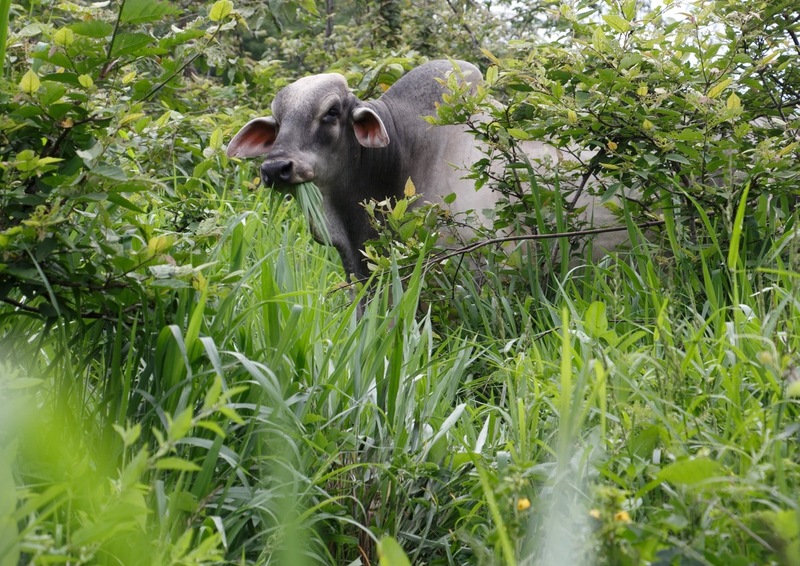 A cow in Colombia enjoys some of the nutritious, fast-growing grass varieties developed at the International Center for Tropical Agriculture. 2019: Jacobo Arango was traveling in a forested part of his country, Colombia, when he ran into one big reason for global warming. He didn't see it, but he could hear it. "You could hear the chainsaw cutting the forest; and the locals [were] telling us that this is nothing unusual for them, that they were hearing that every day," says Arango, who is a researcher at the International Center for Tropical Agriculture, or CIAT. This was totally illegal. But local farmers didn't dare report it. "They said, if you do that, your life could be in danger," Arango recalls. Usually, what follows land clearing in the tropics is cattle grazing. It's a careless, destructive form of cattle grazing, and Tim Searchinger, at the World Resources Institute, says it's incredibly common. "Grazing land is about two-thirds of all agricultural land, and about a third of that came right out of clearing forests," he says. It's a climate disaster. First, cutting down trees and tearing up forest soil releases huge amounts of carbon dioxide. Then, cattle release methane, a powerful greenhouse gas, as microbes in their stomach digest grass and leaves. There are greenhouse emissions from other kinds of farming, too — from plowing and from fertilizer. Add it all up, and growing food accounts for a quarter of the entire climate change problem. That could increase, too, because billions of people around the world are getting richer; they want more beef, too. "There is no solution to climate change that doesn't dramatically reduce the land use demands and greenhouse emissions of agriculture," Searchinger says. He and his colleagues at WRI released a report last year that laid out a road map for how to do this. It includes lots of things, from wasting less food to reducing greenhouse emissions from fertilizer. 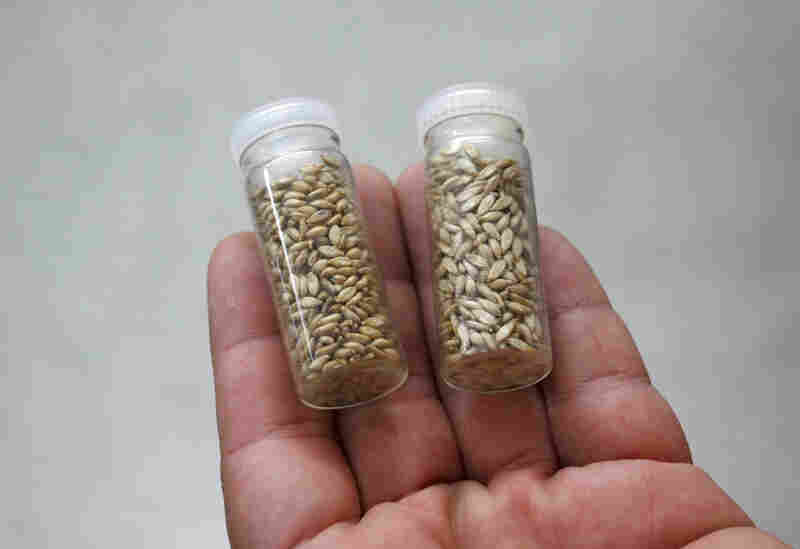 Part of the seed collection at the International Center for Tropical Agriculture (CIAT), in Cali, Colombia. 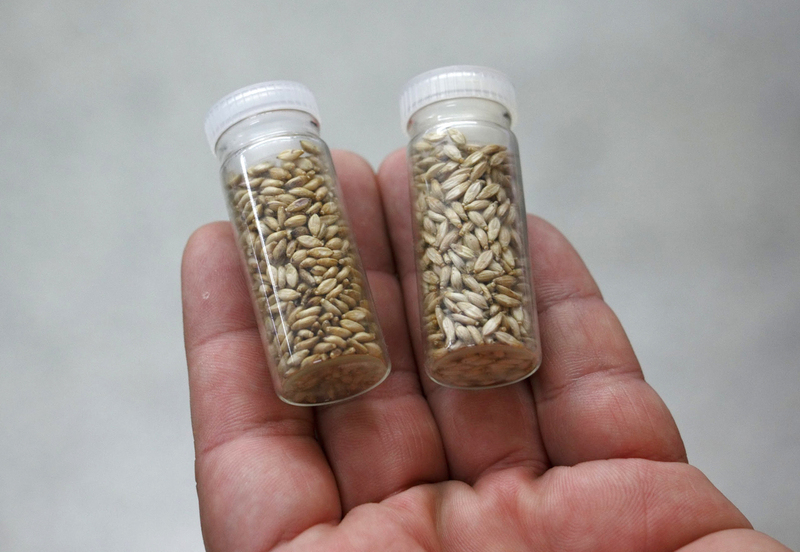 Scientists at CIAT used seeds like these to breed new, fast-growing grasses. But perhaps the single biggest piece of the solution is something we don't often hear about. Jacobo Arango wants to show it to me. He's brought me to a farm in the Patía valley, not far from Colombia's Pacific coast. This is cattle-grazing country. I see wide, grassy pastures, lined by trees. 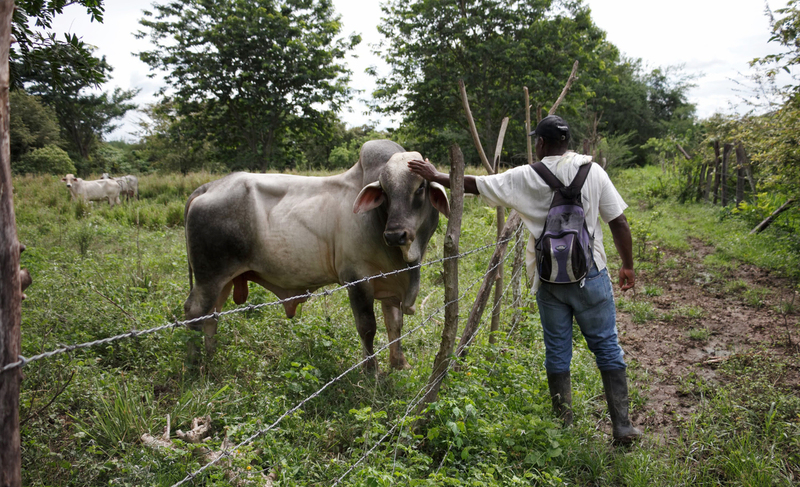 Nohely Angulo Mosquera, the leader of a farmers cooperative, is clapping his hands, calling his cows, inviting them to move to a new pasture. This pasture is a bovine buffet. The grass is up to my waist. This is not ordinary grass that grows wild in this region. These are varieties with names like Mulato, and Cayman, which researchers at CIAT bred and selected to be top-quality cattle feed. 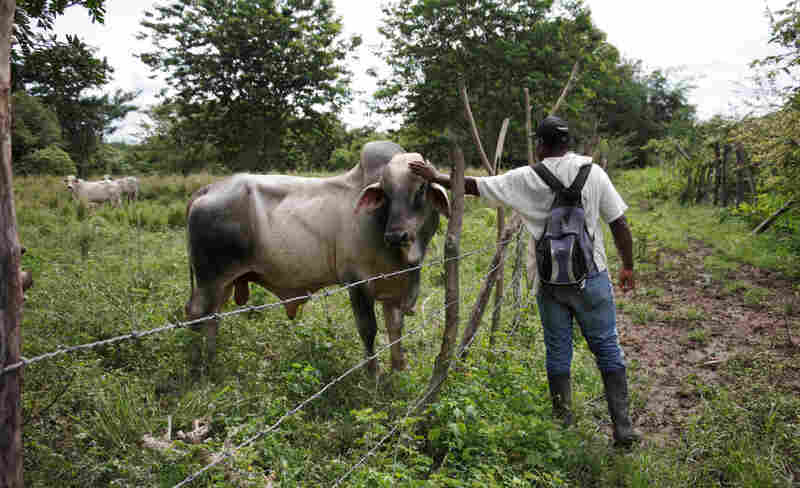 Angulo Mosquera says that these grasses grow so fast, and they're so nutritious, he can keep four or even six cows on land that used to support just one. He does have to manage the cows more carefully; moving them every few weeks to new pastures when the grass is ready. "More milk, more meat," he says. He doesn't mention it, but it's also true: In the old days, his cows took a long time to gain weight or produce a gallon of milk, but their gut microbes still kept churning out methane, day after day, year after year. Now, because the animals are growing so much faster, they aren't releasing nearly as much methane per pound of milk or meat. We're looking at an essential part of a world without climate change. And as we stand there, Jacobo Arango and I just start imagining it's already happened, and talking as though it's real. Nohely Angulo Mosquera is a leader of a farmers cooperative in the Patía valley, in Colombia. 2050: The same way we stopped mining coal to generate electricity, we've stopped mining the soil to grow food. "It's different now, in 2050," Arango says with a smile. In a world without climate change, this is what cattle grazing looks like, all over the tropics. 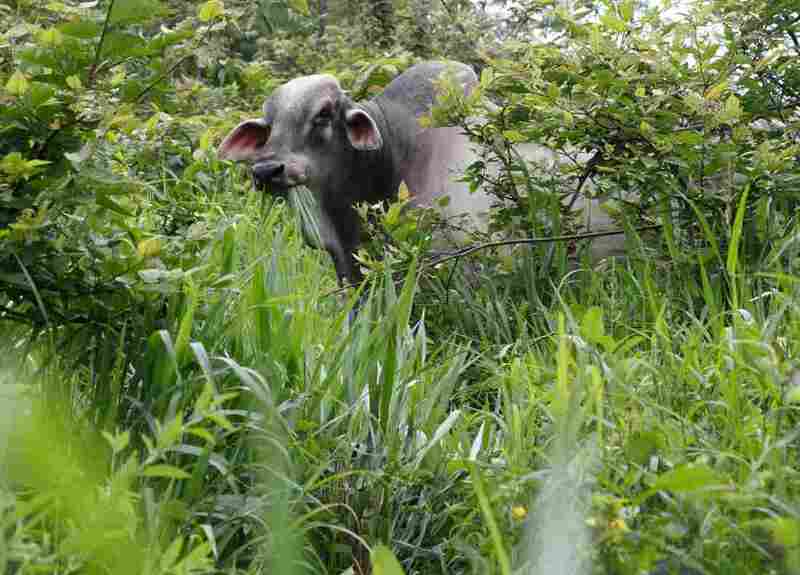 Farmers aren't letting cows wander across the landscape in search of something to eat. They're treating their pasture like a valuable crop, which it really is. "This was critical, to change the mindset of cattle growers," Arango says. As a result, production is way up and "there is no need to cut the Amazon to do livestock production," Arango says. Another critical change: Americans are eating a lot less beef now — per person, half what they ate in 2020. "That's a really, really big deal," Searchinger says. Traveling the country, you now see alternatives to beef and dairy products everywhere. There are blended mushroom-beef burgers in fast food chains and non-dairy cheese on pizzas. They even taste pretty good, thanks to the creative genius of America's finest food scientists. People who stop at these places don't really think about the big global impact of what they're doing, any more than they did when they were eating all hamburgers. But they've been part of something amazing. It's 2050 and there are almost 10 billion people in the world. They are eating better — yet the Amazon forest is still there. It hasn't been sacrificed to grow food. In fact, in parts of North and South America, including that farm we visited in Colombia, more trees are growing. We're not mining the soil anymore. We're replenishing it. A previous version of this story misspelled Rep. Alexandria Ocasio-Cortez's name as Ocasio-Cortes. Also, Sila Kiliccote's last name was misspelled in some instances as Kiliccotte.